Frederick Cooke was born in East Ardsley in 1880/2 as when looking at documents there is a slight variation, but there is an entry on Freebmd for a birth registration for a Frederick Cook in the March Quarter (January, February, March) of 1881 in Wakefield – so that looks like him but with a spelling variation in his name. He was born to Arthur William Cooke and Martha Hardaker along with two other children between 1879 and 1883. Arthur William was originally from Cheverell in Wiltshire, while Martha was from Bishop Auckland – I bet that was a fun household with the variation in accents! The couple married in St Michaels church, East Ardsley on the 15th of September 1877. Sadly, Martha died in the spring on 1890 and with young children to look after Arthur William remarried Emma Wright, when on the 3rd of February 1891, he again walked down the aisle of St Michaels church. The couple went on to have more children. But, back to Frederick – In the census of 1891 Frederick is living at Allinsons Buildings, East Ardsley, with his father, a furnace keeper; his step-mother, Emma; his brother George; sister Margaret and Emma’s nine month old baby boy – written in the census as ‘William Wright, son of wife’. The Christmas of 1903 must have been a busy and exciting time in the Cooke household as within the next few weeks a family event was to take place. On the 16th of January 1904 Frederick would be found standing with his family and friends in St Michael’s church, East Ardsley, waiting for Ethel Fleming to walk down the aisle and become his wife. Fred’s father, Arthur William, was now a lamplighter, while John Fleming, Ethel’s father was a miner. The two witnesses to this event were Edmund Lee and Jane Hunt. Life, does not always deal the cards we would wish, and like many others Frederick, seemed to have been given a few ‘duff’ cards. He had already seen his mother die, his father re-marry and the 1911 census told of another ‘duff’ card. The census shows the couple living at 6 Mary Street, The Falls, East Ardsley, a house with 3 rooms. It tells that he was 30 years old and Ethel was 26; that they had bee married 7 years – we know that from the Parish Register entry, but the paper from 100 years ago also tells that the couple had had one child, and that it had died – died between their marriage and the date of the census. Before I continue with Fred’s life, curiosity was getting the better of me, and it dosn’t take a lot for me to go off on a tangent looking for another story…………..here I go again! Who was this child? When was ‘it’ born? Was it a boy or a girl? How old was he/she when it died? Questions, lots of them, and they seem easier to come up with than answer. Let the questions stop and the answering begin. What do I know, not a lot really apart from his surname would be cook(e) and death occurred between 1904 and 1911, which is too early for a mother’s maiden name to be entered. A search of Freebmd with the search criteria being Cooke and West Riding, brings up a lot of entries – do you know how many there is to search through? A lot! I need to lessen the number of entries. The Ancestry website has very considerately scanned West Yorkshire Parish Registers for certain periods, what can that come up with? 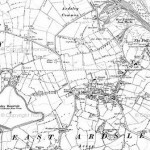 Straight to the West Yorkshire section for deaths and burials using just Cooke and East Ardsley came up wit five possibilities, but by the dates of burials I could eliminate three straight away, leaving two to have a look at. After viewing the first I could also now eliminate that entry as the address was Morley. One remaining, a John Arthur Cooke. John Arthur Cooke was buried on the 23rd of March 1904, his address was given as Whitaker’s Fold, he was five days old and the entry states there was no service. Without purchasing a birth certificate and death certificate John Arthur seems to be the most likely candidate, along with both his grandfathers being Arthur and John. Fred, platelayer, on the Great Northern Railway and being an old Territorial, re-enlisted, some sources say August, while other state September and November, but all agree on the year of 1914. He became Pte., 2425, F. Cooke, in the 1/4th King’s Own Yorkshire Light Infantry (KOYLI). The 1/4th’s were training near Malton, but bad weather was continuing they, (about 4000 of them) were moved to Gainsborough and be billeted within the community. Training continued while some of the men moved to the coast, other stayed and on one particular day, the 19th of February, 1915, they were in the village of Moreton at a place called the Gymes. 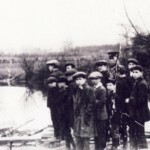 The men were training on an enclosed pond to build rafts, readying themselves for crossing the Belgian canals. A Dewsbury man, Captain Harold Hirst, was in charge of the operation. The rafts were constructed from rope, straw, tarpaulins and a wooden platform. 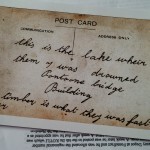 It was at 12:10 on Friday the 19th of February 1915, that as men from ‘D’ Company boarded their raft. As the raft started to leave the bank, their ‘vessel’ crowded with soldiers (some say up to 40) in their heavy kit and boots seemed stable for a while, but Pte., Punyer, who was in charge of a very long pole to push the raft forward, was soon, even with his arm fully in the water, could not reach the bottom of the gyme with his pole. The raft was beginning to become unstable and tragedy soon struck and the men were very quickly fighting for their lives. Those who were closer to the bank dragged men out of the water, others gave artifical respiration. Higher ranking officers were called for, Field Ambulances were on their way and a roll call was sounded but seven were unaccounted for. Five men were found and later in the afternoon, the final two soldiers were accounted for. Their bodies were taken to stables behind the Crooked Billet pub in Morton. An inquest was held the following day in Morton School, presided over by Philip Gamble, a local solicitor with a local builder, Mr Fox, being the foreman of the jury. The jury viewed the bodies and visited the Gyme. After the jury had viewed the bodies they were placed in coffins and taken by Army Ambulance to Holy Trinity Church Hall, Gainsborough, from where they would be taken the next day for their journeys home. Some of the families of the seven men made the journey to Morton for the inquest, where after hearing various statements a verdict of Accidental Death was given but the Officer was criticised for his lack of experience and the lack of adequate safety precautions i.e. life buoys and trained first aid staff. Within days the regiment had been moved to York and were sent to France on the 13th of April and were soon in the trenches at Bois Grenier. The seven soldiers were all given full military funerals in their own villages, towns or cities, where family, friends, neighbours and many others paid their respects. And it was that on 23rd February 1915, from 23 Cardigan Terrace, Frederick made his final journey carried aloft the shoulders of his fellow soldiers and followed by many more, with many carrying floral tributes. The streets were lined as the courtage walked slowly passed, up the hill on its way to St Michael’s church. The party would have been met by the Rev. John H D Hill, who years before had married Frederick and Ethel in happier times, but today was a very sombre occasion as over 2000 from the military and surrounding area paid their respects. The Rev. Hill in his parish register wrote the required information in the set columns and lines but he also added ‘military funeral drowned on pontoon’. We now know how the Fred’s life ended and where he rests, but what happened to Ethel, well, early in 1918 she married Peter Humberstone. She died on 29th of November 1947 and rests within the walls of St Michael’s Parish Church, East Ardsley, along with her first husband and her son. 100 years on to the day …………. 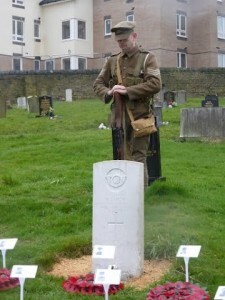 a group of people gathered at the graveside of Private Batty, one of the 7. 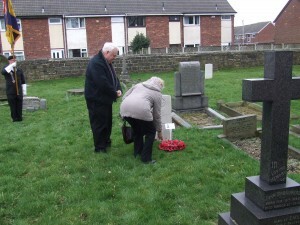 They were there to remember the tragedy by laying a wreath for each one of those men an eighth wreath was laid by people from Gainborough. The following Sunday over 20 people travelled from Yorkshire to Morton for a service and plaque unveiling. It was a wonderful service and a visit to the Gyme followed, braving the wind, rain, bitter cold and the mud, where the wreath laid in Batley, was laid in what remains of a now filled in Gyme. I can’t say that walk was pleasant but having gone that far it seemed only fitting to go and complete the circle. headstones with a small information plaque. The names on the Commonwealth War Graves Commission headstones in most cases bare the name, regiment, service number and age of the casualty, but what they do not tell is the story, so when you see one of those headstones, stop and think if only you could tell your tale. 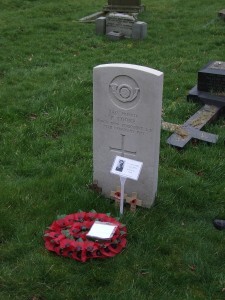 Additional information :- Captain Harold Hirst was the youngest of the officers within the regiment. He was the son of Mr & Mrs Joseph Hirst of Ravensleigh, Dewsbury and a member of the firm of Messrs. G H Hirst and Co., Ltd., woollen manufacturers of Dewsbury and Batley. He was an ‘old boy’ of Rugby School and it was on 24th of June 1915 that Harold was killed by a German sniper. He had previously killed two or three German snipers and this had been mentioned in dispatches. He left a widow and a child which had been born two weeks after he left for the front. So, it was that during the the war many of the men who were at the Gyme on that fateful day also lost their lives. This entry was posted in General and tagged 1901, 1911, Ancestry, Army, burial, campaign, canada, casualty, census, conflict, cwgc, East Ardsley, family, Freebmd, History, memorials, memory, military, miner, names, photographs, records, Regiments, St Michael's church, transcription, WW1, yorkshire on March 14, 2015 by carol.